Tomato blight ripped through the allotment in August this year, turning stems and leaves sooty-black and blotching the fruit. Every plant was dug up and burnt by August Bank Holiday leaving just the greenhouse plants, safe behind closed doors, to carry on free of infection. My greenhouse isn't frost-free and we've had a few very cold mornings now, with the temperature dipping just freezing. While the chilli plants seem to be able to withstand temperatures hovering around zero, the tomatoes are grinding to a halt, the plants looking pretty exhausted, with brown papery leaves and wizened stems, just a few small fruit still slowly turning red in the sunny days. I decided last week that it was time to put them out of their misery and to gather up all the remaining fruits, whether ripe or not, and make a big batch of late harvest chutney, so that none go to waste. 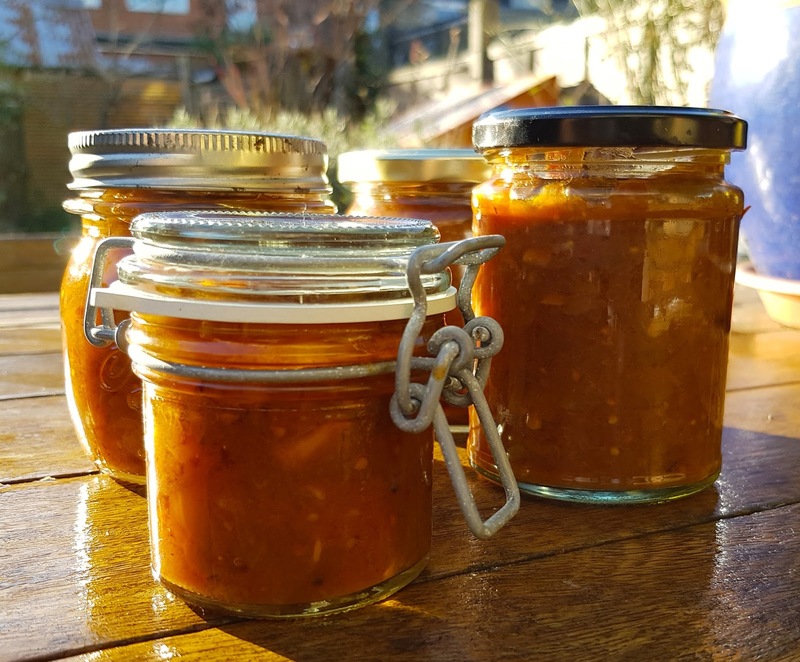 I've called this autumn tomato chutney because while it might lack some of the sweet sunshine and honeyed notes of tomatoes picked in high summer, the rag-tag of season's end tomatoes, green, pinkish, orange and red in places, has a concentrated, distinctively sharper flavour. 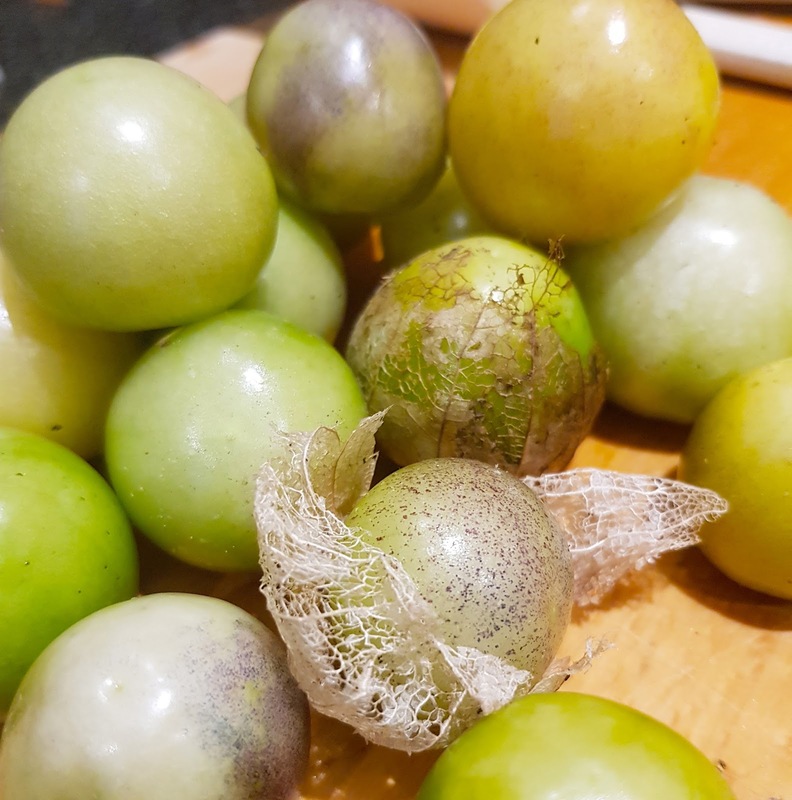 I added a few more autumn pickings: the last of the huge glut of tomatillos, which restore some of the zingy freshness of flavour, a warm chilli or two from the greenhouse for a little bit of fruity heat, and also one of my favourite chutney ingredients, dates. 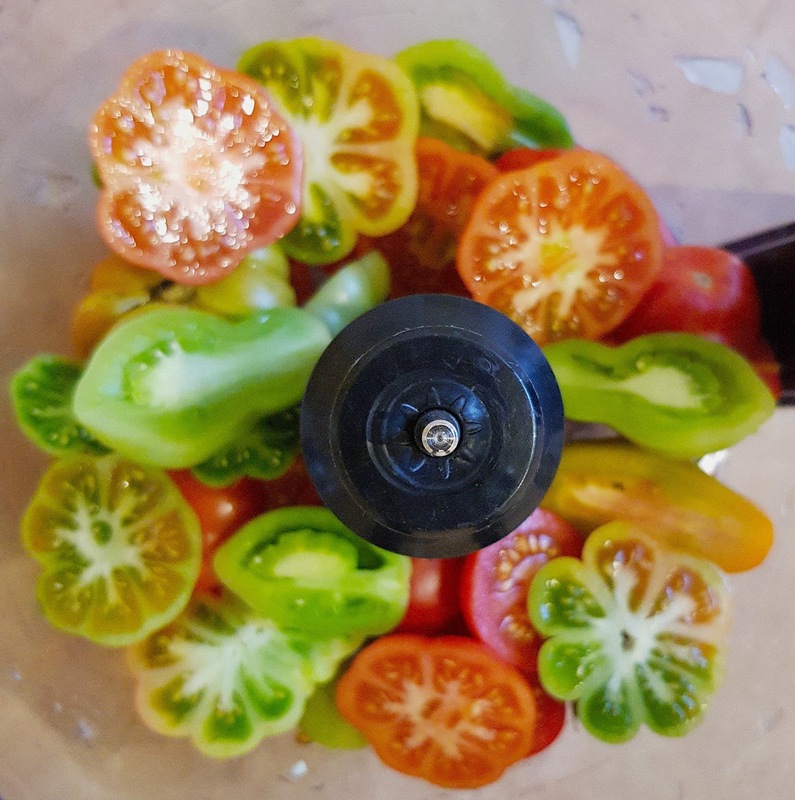 I use these instead of sultanas or raisins quite simply because I like them better, but also because they add a depth of sweet flavour, and a fudgy texture that definitely contributes to the finished chutney. Apart from that, I kept the recipe as simple as possible - I don't think chutneys are meant to be complicated either in quantities or method. If you sterilise the jars and lids and utensils, this chutney will keep for a year or so - leave it for three months to mature before starting to eat it. Chop the tomatoes, onions, garlic and dates. Peel and grate the ginger. Remove the papery husk from the tomatillos and rinse any sticky residue off under the tap. Give a quick shake to throw off most of the moisture. Peel and core the apples, then chop roughly. Put all the ingredients into a large non-reactive pan and mix with a spoon. You might want to hold back 25g or so of sugar and add it to taste as the chutney cooks, depending on how sweet your tooth is. Bring to the boil over a medium-high heat, then cover the pan, reduce the heat and simmer for an hour and a half by which time the chutney should be dark and thickened. While the chutney is simmering, sterilise jars for potting up. The amounts given here will fill around six or seven 250ml jars. I think the easiest way to sterilise them is to run them through the dishwasher on a hot cycle, then dry them off in the oven at 120 degrees while the chutney is bubbling away. You should also sterilise the lids and the utensils used for transferring the chutney. When ready, spoon the chutney into the prepared jars, seal and leave to cool on a wire rack. Label, and transfer to a cool dark cupboard to mature before eating.